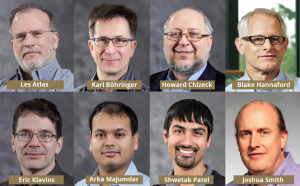 UW EE Professors Les Atlas, Karl Böhringer, Howard Chizeck, Blake Hannaford, Eric Klavins, Arka Majumdar, Shwetak Patel and Joshua Smith were awarded the 2017 Amazon Catalyst Fellowship. In a partnership with the University of Washington, Amazon Catalyst supports bold solutions to world problems. The program provides funding, mentorship and community to the innovative projects. Congratulations to all newly-minted Amazon Catalyst Fellows!